CREATES first student exchange and training event is coming up in July 10-14, 2018 at UCF. 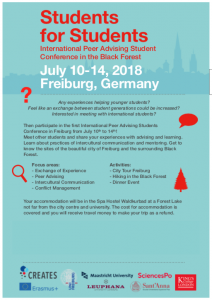 We are pleased to invite 3-4 students from each partner university to participate in the “Students for Students International Peer Advising Student Conference in the Black Forest” to share ideas and advance our joint work on peer advising (IO3). The focus of the student workshop will be an exchange of needs and experiences concerning peer advising among international students. Furthermore, it will include training sessions with a focus on intercultural mentoring and conflict resolution.